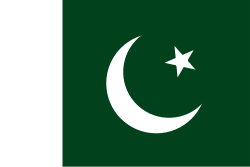 The Pakistani flag features a crescent moon, with a single star located to the left of the moon. The main color of the flag is green, which represents the religion of Islam and the Muslims that reside in the nation. The vertical stripe on the left side of the flag is meant to represent the religious minorities and their religions. The crescent moon was placed on the flag to represent progress, while the star is representative of light. The overall meaning of the flag is to show the country’s commitment to Islam, while also respecting the rights of religious minorities living in the nation. The majority of Pakistan’s flag is dark green, with the official shade being known as “Pakistan green.” The moon and five-pointed star are white, while the vertical stripe located along the left side of the flag is also white. As previously mentioned, the green field was chosen to represent the Islamic majority, while the white stripe represents religious minorities. The modern flag of Pakistan was first flown on August 11, 1947. The design was inspired by the flag of the All India Muslim League. That flag was inspired by several other flags including the Sultanate of Delhi, the flag of the Mughal Empire and the flag of the Ottoman Empire. The flag is commonly referred to as the “Flag of the Star and Crescent,” which is mentioned in the country’s national anthem. Pakistan’s national flag must never fly below another flag. If the flag is located beside another flag, Pakistan’s must be flown on the right side. If there are multiple flags, the national flag must be in the centered or to the right of the center flag in cases where there are even numbers. Pakistan’s flag must never be buried or put into a grave. There are four days when the flag is required to be flown at full mast. These are Pakistan Day, Independence Day, the birthday of Muhammad Iqbal and the birthday of Muhammad Ali Jinnah. On the anniversary of their deaths, the flags must be flown at half-mast.